This modular building is the first modular I built without the use of LDD. My goal for this build was to add colour that would catch the eye, as my previous builds have been bland when it comes to their colour palette. 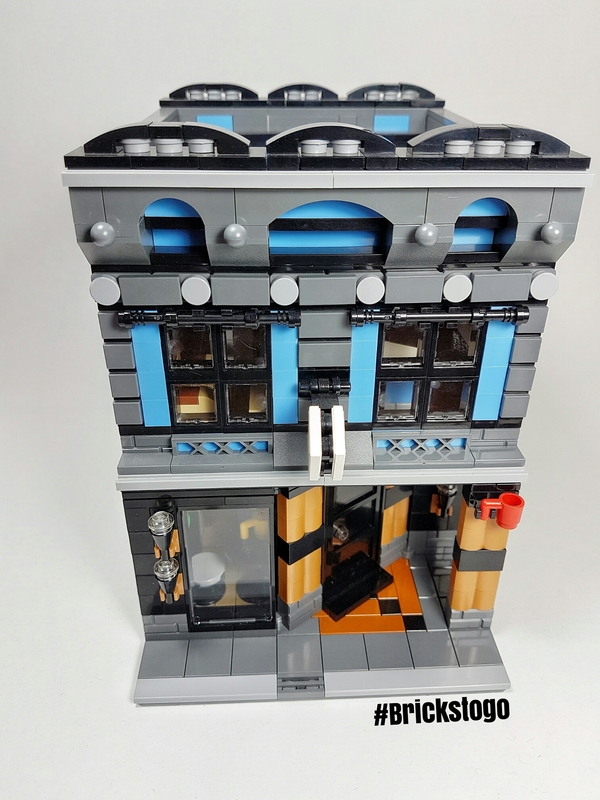 I found that building this Lego coffee shop and bookstore was a lot easier to add colour without using LDD. There’s a big difference between seeing the pieces physically in front of you, versus digitally on a screen. The LDD program doesn’t match the colour of the actual brick very well, and judging what the final product will actually look like is more of a challenge. 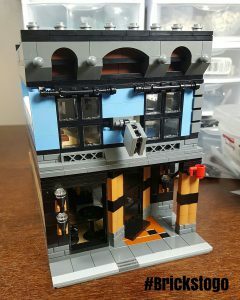 Another goal of mine when building this modular, was to give the building depth and not have a flat facing front wall. After fiddling with some different angles, I found an angle for the front door that I liked and started the build from there. At this point I was really excited to get started on the back wall and patio, but I wasn’t sure I was finished with the front. As I was building, I had to re-build the front section a handful of times because I didn’t like the look. I realized as I was doing this that there is a huge advantage to building on LDD during the trial and error stage. Using LDD you are able to simply delete pieces and add in new ones underneath without actually having to disassemble your work. So there are definitely pros and cons to building on LDD and with physical pieces. Another problem I faced when designing this building, was my availability of pieces. I had a very limited selection of the medium dark flesh colour of the walls, so I had to design my build carefully, using each piece in accordance with how many I had to work with. This was challenging, but in some way helped push me to try different techniques that I might not have otherwise tried if I had lots of every piece. This led me to some interesting ideas, and I would definitely recommend trying to limit yourself when choosing pieces for your next build. It might make things more interesting! 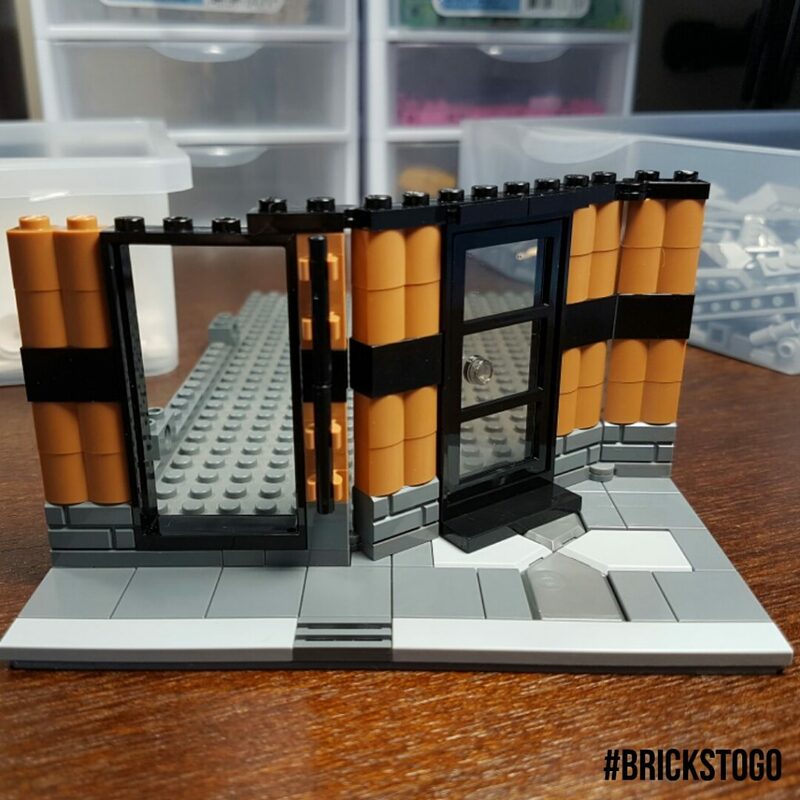 Having completed the first floor, with four walls and a finished interior, I was ready to make a Bricklink order for some parts. If you don’t know what Bricklink is, I highly recommend checking out my other page to find out. It’s an amazing second hand marketplace for Lego, kind of like the eBay of the Lego world, where you can find almost any Lego part, set, or accessory you can think of. Waiting for pieces is one of my least favorite parts about building, as I’m sure it is for a lot of you. However, it does give you some time to reflect on your build and think about what you could change, or things you could do better on in the future. Building Lego is a process, but if you take your time and apply some care and attention, your end product will be much better. You will also gain a much greater sense of accomplishment, which is one of my favorite parts! Choosing the color for the second floor of the Lego coffee shop and bookstore was difficult. I didn’t want the building to look like two separate modules attached together. I wanted the sections to blend together nicely and keep a similar style. The medium blue walls for the second floor really makes the building stand out. The more color the better! With both the front and back walls taking shape, I finally had a rough idea of what the building was going to look like as a whole. But like all builds, in my opinion the roof is the hardest part. Just like the ending to a book, a roof ties of all loose ends of the build and gives it the final finishing touch. I personally find building the roof the best part of the build, because you have a lot more freedom than you do with any given floor of the building. After choosing a style of roof for the build, I played around with some ideas on how I wanted it to look. I love adding depth to my builds because it adds texture, while flat buildings are unappealing, and well… flat! The arched bricks at the top were perfect to complete the look, but I wasn’t sure about the color. Brown doesn’t stand out very much and it makes the roof look dark, while the rest of the building is bright. So it didn’t match, and I ended up changing the color to match the second floor. As you can see in the picture to the right, the second floor still isn’t completed. There are still some stone pieces missing on the sides, and I ran out of blue so the walls weren’t complete at this stage. But waiting for my parts orders was not going to stop me from continuing my progress. When my orders finally did arrive, I had figured out exactly what I wanted to do with the finishing touches of the build, and promptly made the changes. I love how colorful the build is, and I’m excited to work with some other unusual colors to liven up the Lego city! Try it for yourself and build your next project with a color that you ordinarily wouldn’t touch. You might be surprised with the results! Using the LDD program, I would never have chosen these colors to match together, but I am extremely pleased with the results. 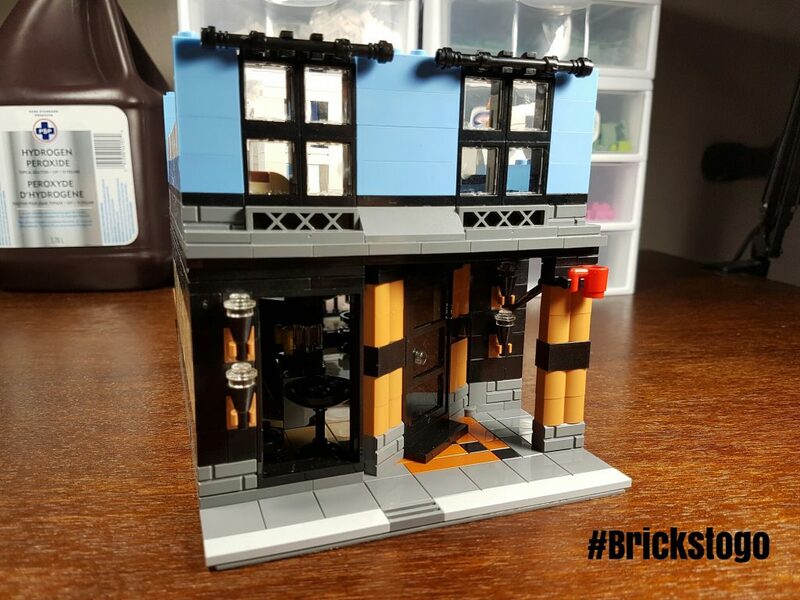 I hope you enjoyed learning my process, and the steps I took to design this Lego coffee shop and bookstore. I had a blast building it, and I encourage you to pull out your Lego and build a custom model of your own! Whoa! AMAZING!!! this is serious talent and creativity, I do appreciate that! Thank you for such a thorough explanation and sharing your thought process and practical stages. 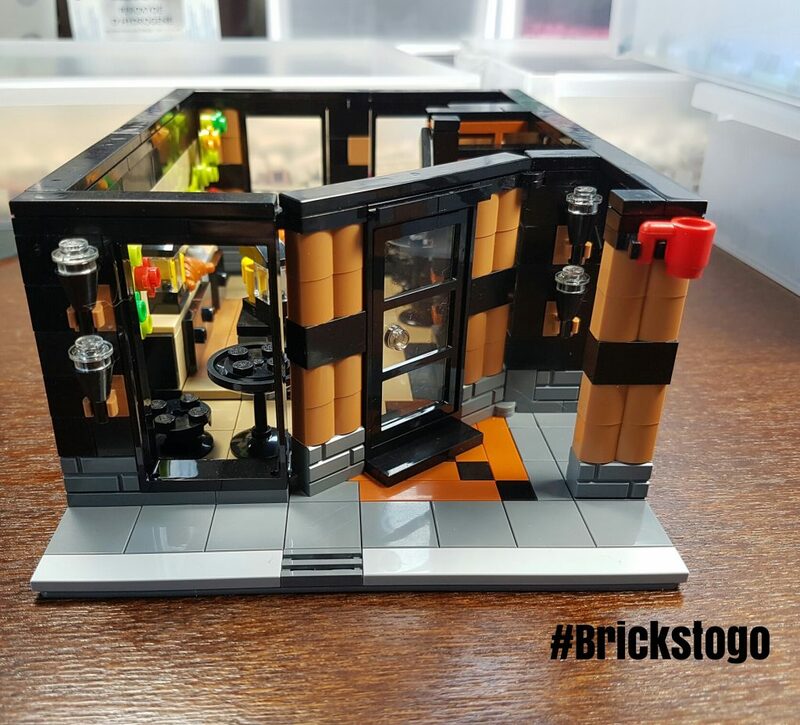 The Bricklink is the best new thing I’ve discovered today:) I wonder if you could make a lego tattoo studio! I’m looking forward to see more of your art, cheers! I hope you were able to gain at least a partial understanding of the process that goes into creating a Lego build such as this. I thoroughly enjoy every step of the process and encourage others to try it for themselves! I can imagine young and old and those inbetween will appreciate this site. A great idea by the way. For the youngsters, having a site to go to for ideas and how to use lego will be a boon, especially with youtube videos to back it up. The last time I built with lego was when my kids were young but I can see the appeal for any age. It must be very therapeutic and relaxing. Apart from the coffee house, I really like your white house! I’m really excited about the direction of the site, and I’m really hoping it’s a hit for kids and adults of all ages. Lego is a hobby that can be shared between friends, family, and even strangers! It’s a great way to meet people with similar interests, and yes, it is incredibly therapeutic! I read this with a lot of excitement that brings back fond memories of my childhood playing with Legos. My set was a farm house and a family bungalow, and I still keep them to this day. This was in the 1990’s and there weren’t as much varieties as they have now. I am very curious to know, how do you come up with your own creation? Do you have a template to refer to or is it something that comes out from your imagination? Thanks! Glad I could bring you a blast from the past! When I build my models, I usually start my design with some key features or colors I want to use. But I don’t use any template (other than the modular building standards) to create my builds. I like to be unique! Please keep this up and upload more designs! Thanks a lot! Lego is a strong passion of mine, and being able to share my creations with people is something that makes it even better for me. That looks cool man, it must’ve took you a lot of work! I’d imagine it was worth it though, this build is really impressive. I like the video you shot, I think it makes it a whole lot easier to grasp what you’ve put together than say, just picture and text. Thanks a lot! It did take me a quite a while to completely finish it. With designing it, and ordering missing pieces, and then shooting the video it took well over a month. But yes, it is always worth it to stick with your projects.